BMO Field is a 2007 purpose built Soccer Stadium located in the city of Toronto, Canada. The 21,566 capacity stadium is home of Major League Soccer side, Toronto FC and occasionally the Canadian National team. BMO Field was completed in time for the 2007 Major League Soccer Season with the inaugural match held against the Kansas City Wizards on April 28th, with the team now known as Sporting Kansas City defeating the home side by a single goal to nil. Constructed on the former site of Exhibition Stadium, the fifth stadium on this plot of land, Toronto’s soccer ground cost a reported $62.5 million dollars to build. Toronto FC’s stadium has a capacity of 21,566 which currently makes it the largest purpose built Soccer Stadium in Canada ahead of Vancouver Whitecap’s Stade Saputo. 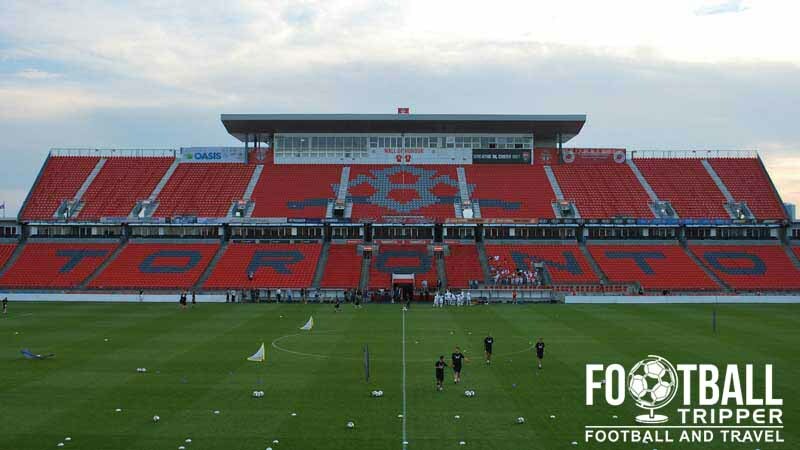 A year before it officially opened The City of Toronto announced a multi-million dollar sponsorship deal with BMO Financial Group to rename the stadium the BMO Field upon opening and for the foreseeable future. 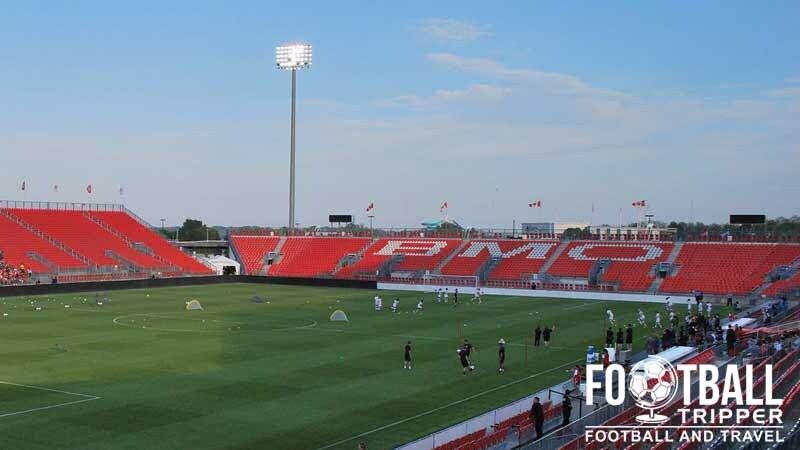 The only time the stadium is not referred to as BMO Field is during International Football matches sanctioned by FIFA who forbid the sponsorship names of stadiums, with Torono FC’s ground becoming known as just the National Soccer Stadium. To date Canada’s National Soccer Stadium has hosted matches of two major tournaments: The 2007 under 20s World Cup and The Women’s version in 2014. 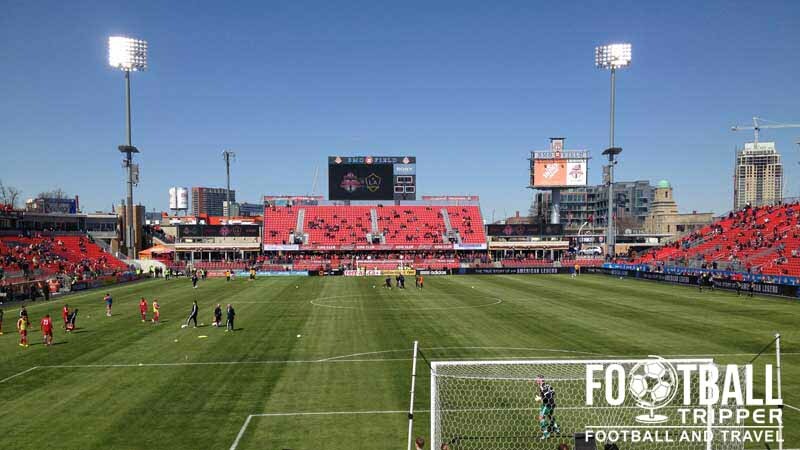 The playing surface at BMO Field has come under some criticism since opening with the club electing to make the switch to natural grass from the 2010 ML season onwards after the installation of improved heating and drainage systems. To date BMO Field has hosted many important matches including the 2010 MLS Cup Final between Colorado Rapids and West Ham United. BMO Field Football Stadium is comprised of four stands: North, East, South and West. 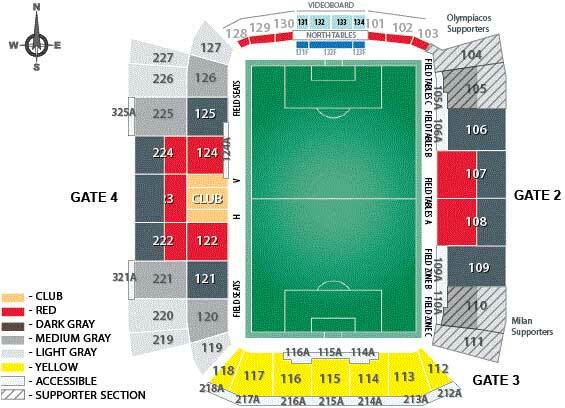 Visiting supporters are usually housed within sections 104 and 105 within the north-east corner of the stadium. Unless you wish to drink beforehand in Downtown Toronto, the main places to drink are located within the vicinity of the stadium. The largest of all places is the Budweiser King Club located towards the Northern Patio where the smallest stand is located, however there is also the Real Sports Bar & Grill which is a decent alternative. Inside the outer concourse area soccer fans are spoilt for choice when it comes to matchday dining options. Covering a diverse range of cuisines there is everything from Taste of Italy to Footy’s Footlongs, and Taco F.C to Hero Burger. To put it simply, BMO Field has you covered. Fans can purchase Toronto FC merchandise from any one of the seven stalls located throughout BMO Field. Located inside the gate, you must have a ticket to enter and the kiosks accept payments both cash and credit cards. As the shops are only open on matchdays, you might want to check out Real Sports Apparel who are the official retailer of the Reds. Toronto fans proudly displaying their colours in the stand at BMO Field. The club seems to have found a really nice shade of red. The operators of BMO Field aren’t currently offering fans the chance to undertake tours of the stadium and facilities. After the planned renovation work in 2016 this may however change. 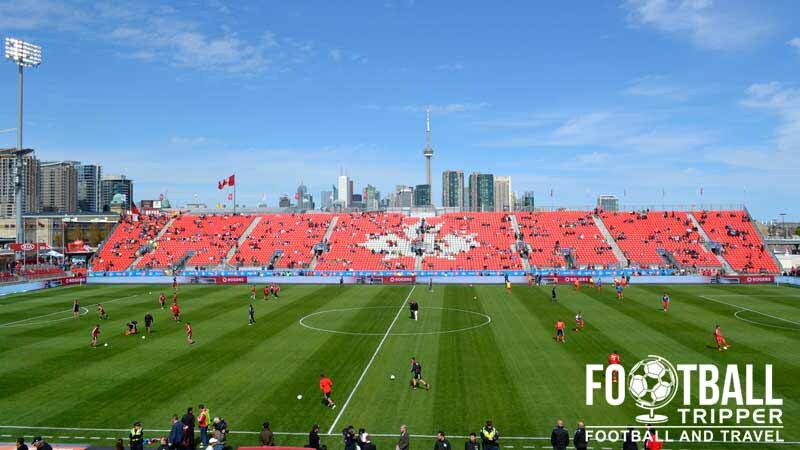 Single ticket prices for the 2015 MLS season are currently unavailable for matches of Toronto FC, but we will endeavour to update as soon as the club releases the information. The Reds were attempting to push season ticket sales at the start of the season which may explain the absence of public pricing just yet. BMO Field is located north-west of Toronto Islands, and less than a few kilometres from Downtown area on the waterfront. One of the many entrances to BMO Field. There are two main types of car park around the stadium which offer over 5,000 spaces: Underground and lot parking. Both car parks are priced at around $14.00 for long stay parking, however depending on the levels of demand expected the price can either fall as low as $11.00 or rise as high as $25.00. For a visual map of car parks around BMO Field please follow this link. The local public transport system known as Toronto Transit is comprised of both street car services and bus routes. The #511 known as Bathurst Streetcar can be taken southwards to Exhibition Place stop, and failing this there is the #29 Dufferin Bus. The closest go station to BMO Field is simply known as “Exhibition”. The exhibition place complex has it’s own GO station towards the northern perimeter on Manitoba Drive. Located on the East-West Lakeshore Line, the nearest stop is known simply as “Exhibition” and is located one away from the main Union Station. For complete timetables and travel information visit GoTransit.Com. For those who live local there are around 23 bike docks towards the east of the stadium which can be taken advantage of. Known as Bixi Bike, the spaces are located east of the ground, inland from Toronto City Airport on Lake Shore Boulevard. The closest hotels by foot are all the likes of the Bonnebue Manor and the Gladstone hotel, however if you’re making a trip of the football then you’re probably better advised catching the Go Rail back into the city centre. Downtown there is much more choice ranging from Hilton Garden Inn to Holiday Inn Express, and The Radisson Hotel Admiral to The Westin Harbour Castle.